If you’ve been thinking about joining the Co-op, now’s the time! You won’t only being getting access to local, affordable and sustainable food — you’ll be joining a cooperative community where each member-owner has a voice. You can try a free trial membership for one month and shop at the store — no work shift required. Or you can sign up for a membership now. To sweeten the deal, we're waiving the $25 administrative fee from all new Lettuce and Avocado Plans through Labor Day weekend. You can learn about all the options and sign up here. And spread the word! Let your friends and neighbors know about the Co-op’s new location and that they can join any time. What’s new at the Co-op? Come see for yourself! In addition to our new, snazzy storefront (painted by Josh Saratitis), we have a beautiful new produce case designed and built by Lindsay Reichart, Gunnar Burke, and Elisia Langdon. All our fridges and AC units have been serviced and we hope to raise more money to buy more display freezers and fridges. 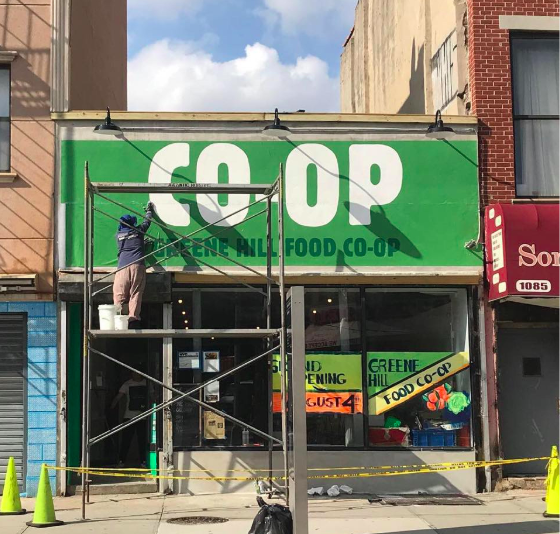 We’ve got new signage inside, as well as a visual guide to the store so that working and shopping members can feel more self-sufficient and strengthen the sense that this Co-op belongs to each and every one of us. And, of course, we also have lots of new products! Like watermelon-flavored kombucha. Mmmm. In our Co-op Q&A, meet Jen Potter who’s been spending several hours a week helping to build out the new store. Not only can she paint, plaster and install drywall, she’s the person on the Merchandising Committee responsible for getting all the Co-op’s tasty snacks. To the many member-owners who have contributed countless hours to moving our store, designing and building the new space, updating our policies and procedures, and raising money: Thank you! We’re planning to hit the ground running. If your recurring in-store shift is an A-Week shift, which started this Monday, July 30th. Together we can get the store stocked and ready to go! We’ve been busy these past few months, and this flurry of activity isn’t quite over. The next few weeks and months will be critical for our business as we swing into gear at 1083 Fulton Street. Above all, we’re counting on all of our member-owners to continue to dedicate their time and energy to this shared business and community. You’ll be hearing from us throughout the rest of summer and fall with ways that you can stay engaged and help strengthen our co-op. A couple things have changed since we left our old home on Putnam. First, we are excited to announce that Lindsay Reichart has been promoted to General Manager. A long-time Store Coordinator, Lindsay’s new, full-time role will be to oversee the day-to-day operations of the store. Second, we have dusted off and updated many of our policies and procedures. We have new policies in place to better ensure all of our in-store shifts are covered. Our membership committee will work to enforce work shift procedures, so please make sure you’ve familiarized yourself with them. Lastly, we’re asking all member-owners who work as cashiers and shift leaders to sign up for a short training. We feel it’s important that members in these roles stay up-to-date with cashiering and shift leading procedures in the new store. We’ve made some changes to help us better manage our inventory and our beautiful new space, and we don’t want to fall back into old habits! Relocating has been a wild ride, friends, and the fun is just starting! We’re looking forward to seeing you at the store soon. If you work as a cashier or shift leader at Greene Hill Food Co-op, you’ll need a quick training before starting your new, recurring workshift. Some store procedures have changed, so it's important to get refreshed on the requirements of your work shift. 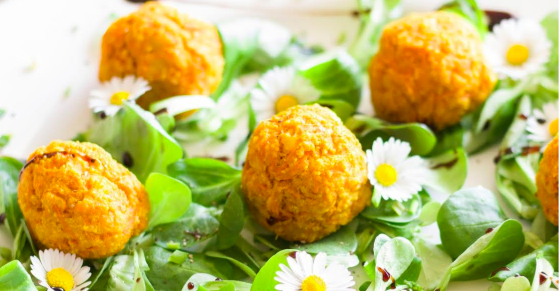 Falafel is one of the easiest things you can make. Don’t believe me? All you have to do is soak the chickpeas and blend them with spices. (Despite your instincts, don’t cook those beans!) The most difficult part is probably remembering to soak the chickpeas ahead of time. After you blend your soaked chickpeas with spring onions and a light handful of herbs, you can add a scoop of turmeric powder for a bright yellow color and a delicious, fragrant aroma. You can find chickpeas in our bulk aisle, and they’re one of the most affordable, nutritious foods in the Co-op. They’re packed with protein, fiber and carbohydrates, and minerals such as calcium, magnesium and zinc. And even though they’re fried, they’re still healthy — my instructions help you use less oil than you’d expect. Optional toppings: tahini, lemon juice, pickles, fresh herbs like parsley, cilantro, mint, etc. The night before you are going to make falafel, soak the dry chickpeas in a bowl with at least 3 inches of water covering them. When you are ready to start making the falafel, drain the chickpeas from the water and ensure that they are very dry (you can pat them with paper towels or a dish towel to remove any excess water). Place the chickpeas, parsley, garlic, and spices in a food processor fitted with a blade attachment. Pulse until the ingredients start to start to bind together. Then allow the falafel mixture to rest in the fridge for 15 minutes. they’ll cook more easily and soak up less oil this way. The balls should be roughly the same size so they cook evenly. Fry them until they’re golden all over, around 3-4 minutes. Remove them from the pan and drain them on paper towels. If desired, sprinkle lightly with salt while still hot. To round out the meal, pile on some of the suggested toppings, and serve your falafel with pita bread or rice and a salad of mixed greens. Q: When did you join the Co-op and why? A: I became aware of the Co-op when I moved to Clinton Hill six years ago. I moved around a few times but when I found myself back on Franklin Avenue, I decided to become a member! I joined because our produce is fresh, local and interesting, and some goods here are cheaper than elsewhere. The values, ethos and economic factors drew me in. Q: How are you involved in the Co-op? A: I started out as a cashier, and in 2017, I joined the Merchandising Committee. I buy all the “junk food”— chips, crackers, candy, chocolate, nutrition bars, and snacks. If you have special requests or suggestions, you can always email productrequests@greenhillfood.coop. In fact, a lot of our new products are a result of our members’ suggestions! Currently, I am volunteering several hours a week building out our new co-op. I’ve been painting, installing drywall, plastering, cleaning and supervising. There are so many people I’ve met here while supervising and building out the new space. Many of them are brand new members who have worked here several times and hadn’t had a chance to shop with us at our old location! It’s incredible to see that level of ownership from our new members. Q: What has it been like for you, volunteering as much as you have to build our new co-op? A: One of the added benefits of helping with the build-out has been the opportunity to talk to other member-owners about their hopes and dreams for the reboot. I’ve been conducting an informal survey on what kinds of products they’d like to see carried. I’ve also been having many meaningful conversations with people who walk in and ask “what this is all about?” We talk about the structure of our co-op, the importance of healthy, affordable food, and the neighborhood. Being here on Fulton Street, especially after we removed the front gate, brings people in to talk and we get to know people who live in the neighborhood and are excited about what we’re doing! A: I love to garden. I have a rooftop garden with native flowers and some edibles that I share with my downstairs neighbors. And this past fall neighbors and I planted daffodil bulbs in our tree pits as part of the New Yorkers for Parks Daffodil Project. This spring I entered by block into the Greenest Block in Brooklyn Contest run by the Brooklyn Botanic Garden (BBG), hoping that it would inspire my neighbors to take greater pride in our block. An added benefit was getting free tulip bulbs from the BBG! I also enjoy long-distance running, knitting, and working on my sketching skills. Q: How can members help out with the transition into our new Co-op? A: Anyone can sign up for shifts — we need all the help we can get! Additionally, I’m looking for support on the merchandising committee. I need help gathering price comparisons at the nearby grocery stores. Email Jen at jspotter@mac.com if you have some spare time to go comparison shopping. The Greene Hill Food Co-op Monthly is edited and published by the following member-owners (in alphabetical order): Liz Baker, Carola Burroughs, DK Holland, Alexandra (Aly) Miller, and Gitta Zomorodi. Contact us with any feedback.